Dr. Hashim Khan is a qualified interventional cardiologist looking after the locality of La Quinta, CA. Dr. Khan obtained his medical degree from Northwestern University. He went on to complete a residency in internal medicine at Northwestern Memorial Hospital. Further, he completed two fellowships at Scripps Clinic, one in general cardiology and the other in cardiovascular disease. Additionally, he is fellowship-trained in interventional cardiology at Northwestern Memorial Hospital. He also holds a bachelor’s degree from the University of Illinois, Urbana-Champaign. 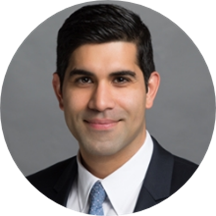 Dr. Khan is board-certified in cardiovascular disease and interventional cardiology by the American Board of Internal Medicine. He sees patients at FCPP Surgical Associates. During his medical training, Dr. Khan was fascinated by the complexities of the human heart and the technological advances made in the field of cardiovascular medicine. After working as a hospital medicine specialist for one year, he decided to pursue his passion for the heart and moved to San Diego for fellowship training at Scripps Clinic. Dr. Khan aims to use cutting-edge technologies, evidence-based science, and innovative methods to treat his patients. He believes in fostering a healthy physician-patient relationship that facilitates assurance and respect.